The IP44.de Shot Indoor can be variably aligned and positioned on its lamp base. The interior light is available in different surfaces. The IP44.de Shot Indoor is so far the only indoor lamp of the renowned manufacturer IP44.de, which is famous for its high quality outdoor lights. On the included aluminum lamp base, the table and floor light can be placed anywhere at any time. The lamp can also be individually aligned on the lamp base. This allows the lamp to be used for both direct and indirect lighting. 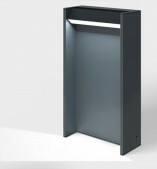 The table lamp is made of aluminum die-casting and has a cover made of clear tempered safety glass (ESG). Tempered safety glass is particularly shock and impact resistant as well as insensitive to temperature differences. 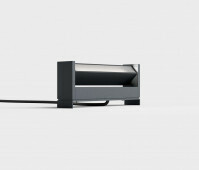 The lamp is available in brushed aluminum, deep black and pure white. With the dimmer on the supply line, the table spotlight is switched on and off as well as dimmed. The brightness can so be adjusted as desired. The lamp has a soft-start function, so that the brightness increases slowly when switching on. A memory function saves the last set brightness level so that it is automatically selected the next time the lamp is switched on. On the back of the lamp body, minimum and maximum dimming settings ​​can be set variably. The cable including safety plug and cord dimmer has a length of 180 cm. 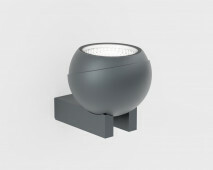 The lamp base has a diameter of 8 cm and a height of 1.6 cm. The table lamp including base is a total of 12.9 cm high and has a diameter of 13.75 cm. The Shot Indoor has an included LED with a power of 15 watts, 1,350 lumens and a colour temperature of 2,700 Kelvin extra warm white. Integrated is an LED with Ivylight technology. The IvyLight technology originally developed IP44.de for its outdoor lights. This technology achieves 10% more light efficiency than other LEDs and saves 10% more energy than other LEDs. The IP44.de Shot is also offered as outdoor lamp with protection class IP65. 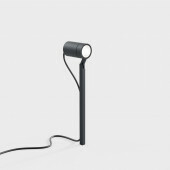 The lamp was designed in 2017 by Sebastian Büscher. It has already received the Red Dot Award and the IF Design Award.